Coaldale Emergency Services and Kate Andrews High School are partnering together to offer a unique course. Starting this fall, KAHS students in grades 11 and 12 will be able to take part in the Kate Andrews Fire Academy. The idea for the academy came about after Experimental Learning Week last year, which saw 10 KAHS students visit the fire hall and learn skills such as standard first aid and CPR. After discussions with NAIT and Palliser, they were able bring the Kate Andrews Fire Academy to life. The academy will be a dual credit course that is run by NAIT and Coaldale Fire Department, and would give the students the chance to earn certificates such as International Trauma Life Support (ITLS) Basic Provider; Incident Command System 100, Heart and Stroke Basic Life Support (BLS) CPR; Medical First Responders course, with a fitness component required; NFPA 1001 Firefighter 1 Certification; and NFPA 472 Hazmat Awareness and Operation. Dual credit courses allow students obtain credits at both the high school and post-secondary levels, allowing them to explore possible career paths without the need to pay tuition fees. The program has also received $50,000 from a provincial grant to help with start up costs. As protective equipment will need to be purchased for the students, the funding is something “we’re really grateful for”, according to Jason Kupery, director of learning for Palliser Regional School Division. Kupery said one of the things they have been hearing from students is that they wanted to be engaged in different ways in their education, such as hands-on approaches, as opposed to the traditional education style. While a similar program exists east of Edmonton, this program will be the first with a medical first responder component. After completing the program, McKeown said that students could apply directly to a NAIT primary care paramedic program, as they would already have the prerequisites needed to apply. They would also have the needed requirements to get a job as a career firefighter in places such as Edmonton. 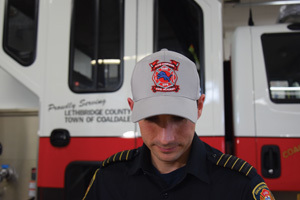 Students who plan on staying in Coaldale will also have the needed training to join the Coaldale Fire Department. McKeown noted they have already received a lot of interest about the program from students. The fire academy will be a two-year program. In the first year, students will take first aid CPR training, ICS 100 and the medical first-response course from NAIT. In the second year, the focus will shift to firefighting, and they will complete the NFPA 1001 and Hazmat 472 courses. A parent information night about the program went last Wednesday, and applications will be going out for students to take part in the program. The fire department will be going through them to select the participating students. Grade 11 and 12 students can apply for a spot, but grade 12 students would receive accreditation for the medical portion, during the first year of the program, as they would be graduating before the fire portion takes place. “Unfortunately, the (grade) 12s won’t be around to get the fire side of things, but they will get the medical first responder. So we will run two EMS based classes that year,” said McKeown. The fire academy will take place in the afternoon during regular school hours. Students can expect about three-hour blocks of course work during the first year, and four-hour blocks once a week in the second year of the program. The first class will be composed of up to 18 students; to ensure there are enough instructors to go around, with 18 more being accepted the next year. McKeown says they are looking for students with a good attitude and commitment to the program.